Pin It This is the first time I made a souffle, I was a bit nervous about it. I heard that it's tricky to make it right. I read all the tips, did my best not to break the whites when folding them into the souffle, and I think it turned out very nice. After I removed it from the oven though, it kind of lost it's fluffy top. I don't really know if it is normal for souffles to "sink" after it's been seating around for a while, but I thought the consistency and taste were really good. 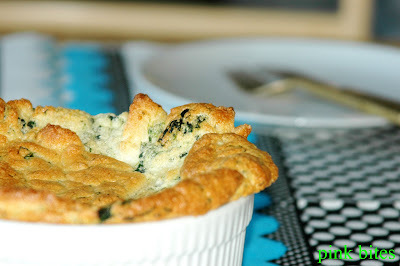 I will keep trying other types of souffles, maybe carrots will be next. This recipe is from the book Eating by Color by Williams-Sonoma. Quickly blanch spinach leaves in boiling water and run under cold after. Squeeze all excess water and chop it. Melt 1 tablespoon of butter, add onions and cook until translucent. Add spinach and cook for about 2 more minutes. Set aside. Melt 3 1/2 tablespoons of butter, when it foams remove from heat and whisk in nutmeg, flour 1 teaspoon of salt and 1/4 teaspoon of black pepper. Return to medium-high heat and slowly whisk in milk. Cook, whisking constantly until it thickens. The sauce should cover the back of your spoon. Remove from heat and let it cool. While it cools, beat 6 egg whites until stiff peaks form. In another bowl, beat the 4 egg yolks until creamy. Whisk egg yolks into cooled white sauce until well blended. Sir in spinach mixture. Sit about 3 tablespoons of the egg whites into the mixture to lighten it, then gently fold in the rest of the egg whites,. The best way to do this is to use a rubber spatula. 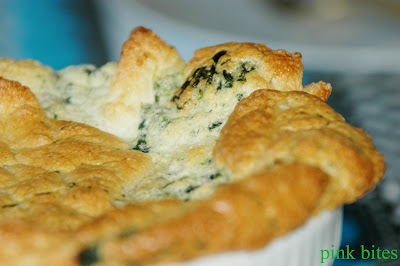 Pour it into prepared souffle dish and bake it until golden brown, about 35-40 minutes. 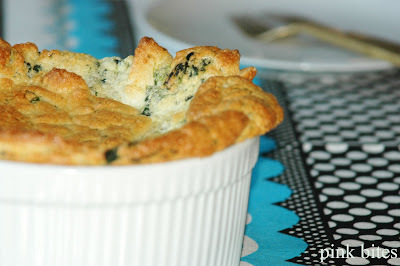 You're a PRO with making souffles, if you ask me - looks perfect! !